Generally alate refers to a winged reproductive caste from a social insect colony in its winged form. Their common behavioural purpose is starting a new colony, to expand their mother colonies etc. Colonies of termites and ants produces alates. Also sycamore seeds are alates. It is a flight-based form of reproductive technique. In a termite colony, alates (winged males and winged females) disperse in a specific period or a month. Male and female pair to each other during flight, shed their wings, start a new colony. Alate is an adjective that refers to wings or winglike structures. In entomology it usually refers to the winged form of a social insect, especially ants or termites, though can also be applied to aphids and some thrips. 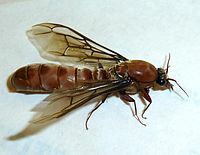 Alate females are typically those destined to become gynes (queens), whereas alate males are occasionally referred to as "drones" (or "kings", in the case of termites). However, the existence of reproductives that do not have wings (e.g., ergatoid queens and gamergates) necessitates a term to distinguish the winged from the wingless reproductive forms. This is an example of polymorphism associated with eusociality. A "dealate" is an adult insect that shed or lost its wings ("dealation"). In botany alate refers to winglike structures on some seeds that use wind dispersal or it may be used to describe flattened ridges which run longtitudianally on stems. Look up alate in Wiktionary, the free dictionary. ^ Collins Dictionary (Seventh ed.). Collins. 2008. p. 34. ISBN 9780007261123. ^ Harrison, Lorraine (2012). Latin for Gardeners. Royal Horticultural Society. p. 20. ISBN 9781845337315.